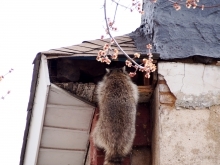 Raccoons: Unwelcome House Guests - Pest Control Alabama | Bama Exterminating Company Inc.
We’ve all been there. Coming home from a fantastic night out with friends and family and discovering a horrific scene on the front lawn. Debris, litter everywhere, rotten fruits and veggies and last week’s meatloaf all served up on a silver platter—well, on a silver trash can lid, anyway. Worst of all, the culprits responsible are nowhere in sight. But we all know who it was: Raccoons, those dastardly rapscallions and thieves. Now imagine the damage they could do to the inside of your home should they find their way inside. Raccoons may be cute (at times) but they are also capable of becoming unmitigated forces of destruction. Your home knows this better than anyone. Raccoons can destroy your home’s insulation in a shorter time than you would expect. They will use it to nest and raise their young, and they can seriously jeopardize the efficiency of your insulation and energy output. Damage from raccoons can mean thousands of dollars in inflated energy bills as well as repairs. One of the most disgusting and concern-worthy issues that raccoons bring into your home is the idea that they can and will use your attic or wall spaces as a giant litter box. Raccoon waste can pose a serious health threat as their excrement can contain roundworms. These roundworms can cause an infection that can cause potentially fatal damage to human nervous systems. Raccoons have powerful little paws that can pull back siding and reveal crawl spaces they can use to enter your home. Once inside, they will scratch and claw their way through air ducts and other obstacles as they search for warmth or food. If your home has been hit by raccoons and you are in need of assistance, look no further than Bama Exterminating Co. We have the tools and the knowledge necessary to remove the animals and prevent them from becoming unwelcome house guests in the future. Contact us today for more information.